When I previously studied for CCNP Route, this was the area that I kind of didn’t pay too much attention to as I wasn’t too interested, however second time round I have taken this in a lot better and managed to sum this up in the following steps. Quite straight forward really, just a case of remembering the correct syntax and using IOS help along the way. 2 instruct the interface participating in EIGRP to use MD5 authentication. How to enable neighbour authentication in EIGRP. 1b. Additionally you can set the send and accept lifetime values for the key. 2a. Set your authentication mode under the interface that participates in EIGRP. An interface that is declared ‘passive’, is an interface that doesn’t participate in EIGRP. The interface will not send any Hello packets to any neighbours and therefore not form an adjacency. Option 1: Use the passive-interface default command to make every EIGRP-enabled interface on the router passive, and then use the no passive-interface command to indicate the interfaces that should not be passive. Option 2: Use the no passive-interface default command to disable this feature globally, and then use the passive-interface command to indicate interfaces that should be passive. This command is performed globally with the EIGRP process and not on an interface level. We can use the redistribute static command within EIGRP, this will redistribute any static routes such as the default route into the routing process. *We must also specify the K values (Bandwidth, Delay, Reliability, Load and MTU) as per standard redistribution INTO an EIGRP AS. Using the ‘ip default-network’ command, however we must be sure that the default route is within the routing table of the local router that we issue this command on. This command is issued in global config, not within EIGRP. Using a network statement with the EIGRP AS. Yes we can in fact use ‘network 0.0.0.0 0.0.0.0’ to advertise our default route to EIGRP neighbours. When we use this command the AD of the route will be internal with 90 and not 170 D EX as per a route learned by redistribution. Make sure you spend some time and set up a solid address allocation scheme before you deploy your network. Ensure that you’ll be able to perform manual route summarization where desired. Avoid discontigious networks whenever possible. Make sure your routers have sufficient memory and CPU to do their jobs. Your hub routers in any hub-and-spoke deployments will be the workhorses of your network. The total EIGRP traffic crossing all of your VCs should not be greater than the total capacity of the line. The bandwidth allocated to EIGRP on each VC should be the same on each interface. When there are no subinterfaces in use and the CIR is the same for every VC, just add up the CIRs and you’ve got your bandwidth value. Cisco has stated you can take the lowest CIR value and multiply it by the number of VCs. This isn’t the recommended solution, but it is valid. A more viable solution involves configuring point-to-point interfaces and assigning individual bandwidth values, having those match the individual CIR of each VC. This is Cisco’s recommendation for this situation, and this allows each router to work more closely to capacity. Add the CIR values for each circuit using that multipoint sub interface to arrive at the correct bandwidth setting. By default, EIGRP uses up to 50 percent of a given interface’s bandwidth as set by the bandwidth command. If you wish to change this default, it can be done with the interface-level command ip bandwidth-percent eigrp. R1(config-if)#ip bandwidth-percent eigrp 100 ? In a hub and spoke topology, the spoke routers normally have only 1 next hop to breakout. This will always be the same next hop address, beyond the spoke router is nothing so this really is a dead end. Therefore we can configure our spoke routers as stub routers. We can eliminate DUAL Queries, as the hub should never have to ask the spoke routers for the route that has been lost. The spoke routers do not need to carry a full copy of the routing table, but instead can survive with a single default route to the hub. A stub router can only a neighbour with a hub, not a fellow spoke router. This also assist SIA situations as the hub will never send the Query packet into the spoke/stub routers. *We can specify on the stub what networks to advertise to the neighbouring hub router. EIGRP and RIPv2 automatically summarize routes when they are advertised across classful network boundaries. When you have discontiguous networks (subnets of the same major network number that are separated by another major network number), this behavior can result in suboptimal routing at its worst. *Already covered in previous EIGRP posts. Where to disable auto summary? The best place to turn this feature off is normally at the spoke routers, as they are advertising networks and performing summarization facing towards the hub router. Configuring any kind of manual summarization does NOT enable or disable auto-summarization — they’re two separate operations. The routing tables are smaller, making the entire routing process faster. Since the tables are smaller, the load on the CPU from the routing process is lessened. The more-specific network numbers are hidden. The impact of flapping routes on the rest of the network is lessened, and correct summarization helps to limit the number of EIGRP queries. With the help of manual route summarization, we can knock this table down to one line. First, we use binary math to convert the subnet numbers to binary strings. The decimal value of these bits is the summary route. The number of common bits yields the summary mask. Here, the value of the common bits (bolded above) is 100.0.0.0. There are 13 common bits, expressed as /13 in prefix notation and 255.248.0.0 in dotted decimal. Where to configure the manual summarization? It’s important to keep in mind that when you configure EIGRP summary addresses, your neighbor relationships will be lost. When they come back up, R3 will have a single summary route instead of the seven more specific routes it previously had. The summary route is seen as a route to Null0, which is basically a route to the trash can. If a packet comes into this router that doesn’t match one of the seven more-specific routes, it will be “black-holed” – dropped by the router. This default behavior of EIGRP route summarization helps to prevent routing loops. This null route will only be seen on the router performing the manual summarization. How do we find the AD value of 5 for this summary route? The first number, 2195456, is the route’s feasible distance. This is the full metric of the route to the destination network. The second number, 281600, is the route’s advertised distance. This is simply the metric from the next-hop router to the destination network. For the path to be considered valid, the advertised distance must be less than the feasible distance. This ensures that the next-hop router is indeed closer to the destination and acts as a routing loop prevention mechanism. 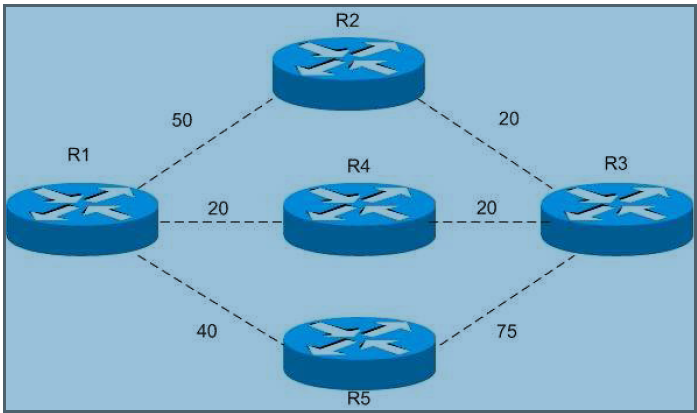 These distances are also used by EIGRP to determine what routes can be feasible successors. The second route can’t be a successor, because its FD (2323456) is higher than the FD of the successor (2297856). Can it be a feasible successor? Yes, because the advertised distance of that route (409600) is lower than the feasible distance of the successor (2297856). This is the Feasibility Condition. That route is then entered into the topology table as a feasible successor, and should the successor go down, the feasible successor will become the successor. To decide if any of these three routes could be a feasible successor, just compare the AD of the route to the FD of the successor. The route is put into Active state, making the route unusable. The router sends DUAL Query packets to EIGRP neighbors, asking them if they have a loop-free path to the destination in question. You cant apply the variance command to any path that doesn’t meet the feasibility condition. PATH 3 fails the check and therefore we can’t include this path with our load balancing. But what if we want to include this link in our load balancing?…. So… we use a variance of 2 which will multiply the FD of the successor to 80. Path 3 with an AD of 75 is now lower than the FD of 80 and passes the Feasibility Condition. PATH 3 can now be used with the variance command as it qualifies as a Feasible Successor. This is a really simple concept, but for some reason when going through a real world example it does hurt the head a bit.. Best to be calm and approach any example as above. As well as Internal EIGRP routes with an AD of 90 there are 2 other types of EIGRP routes. External Routes with an AD of 170 and highlighted by D EX which are learned by redistribution. Summary Routes with an AD of 5 are routes sent back to their classful boundary using auto summary or a specific subnet mask by using manual summarization.